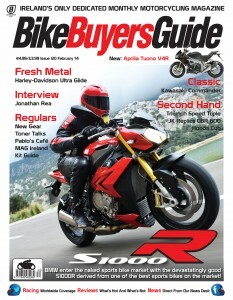 The January issue of Bike Buyers Guide is now in the shops and MAG Ireland has been afforded the opportunity to explore some of the challenges facing riders today through a page in the magazine. In this issue we take a look at licensing on the first anniversary of the third driving license directive which has seen the most significant changes ever introduced to the process of getting on the road on two wheels. Gone are the days when novice riders, young or old, could obtain a provisional license and wobble off down the road learning, or not, as they went. Today’s newly qualified rider has had the highest standards of training applied throughout the process, but with reports of long delays in the issuing of permits and licenses, and serious difficulties for some who were caught between the old and the new systems, what now that the dust has settled? This issue also features BMW’s new S100R, Harley’s latest ultraglide and lots more plus the usual selection of news and views on Irish motorcycling. On sale now from all good newsagents at just €4.99.